It is autumn on the Island. The crowds are gone. Winter is looming. A north zephyr buffets us, hand in hand, along West Beach. Ahead an auburn sunset settles over Galveston State Park. Rows of pillared houses stand tall and dark, storm shutters drawn. We hold each other close against the bite of the late October gusts. The aura is peaceful, like our own little world. 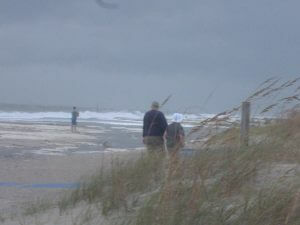 Few venture out of their cars and homes to walk the beach or brave the harsh winds. The roar of the surf sets the stage. We concede our subservient role. Strange that in the presence of power we feel calm. A sweet surrender. We walk silently until our solitude is disturbed by a figure emerging from the evening mist. A man bent into the wind is battling his way up the beach. Each step is a struggle. His hands are pocketed in a faded jacket. Head down, his grey hair blows straight back, thin at the top. He pauses for a breath. As we approach he looks up. He is staggered by a windy blast. I reach out to help. He manages on his own. We pause as his wisdom registers. He has done the thing we all dreamed of when we were young and all things were possible. He found a love that would last. I lock eyes with my mate in the waning light. The old man has brought home to me how much I’ve taken for granted. I turn to thank him, but he is gone. Now only a shadow headed toward a darkened house…alone.